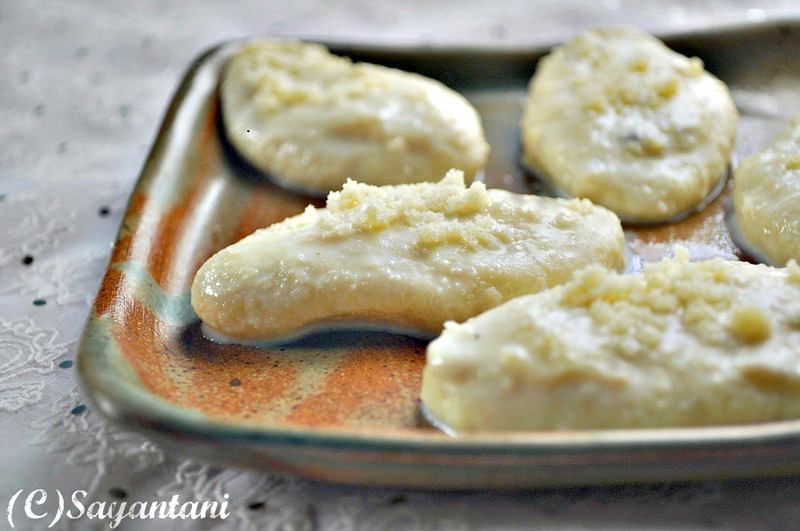 I have a very popular Bengali mishti recipe today. A sweet that’s not as famous as its counterpart Rasomalai but tastes equally good. This sweet is our household favourite for its melting in the mouth texture and mild sweetness. If you just let go of the thought of calories and fat, trust me it gives you an heavenly feeling. Put this in your mouth, close your eyes and forget everything else. Just enjoy how sweet life is. 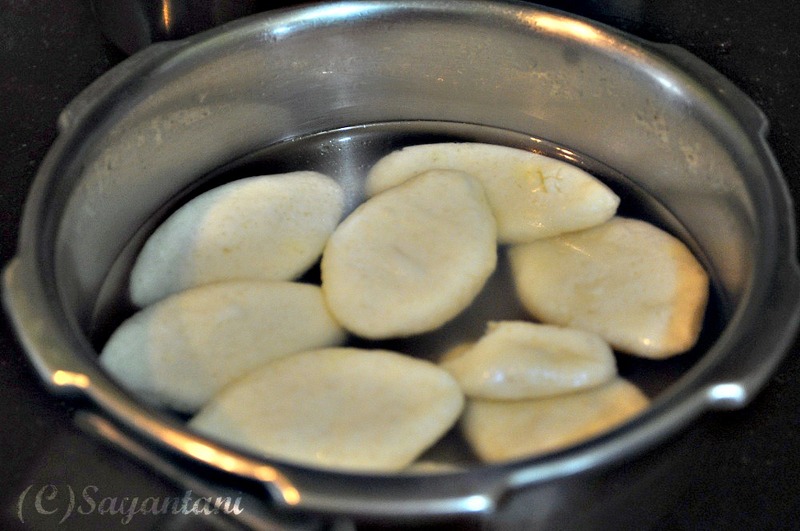 Chomchom or chum chum in itself is a popular variety of mishti. Its almost like rasgulla but the shape and the sugar syrup consistency are different. 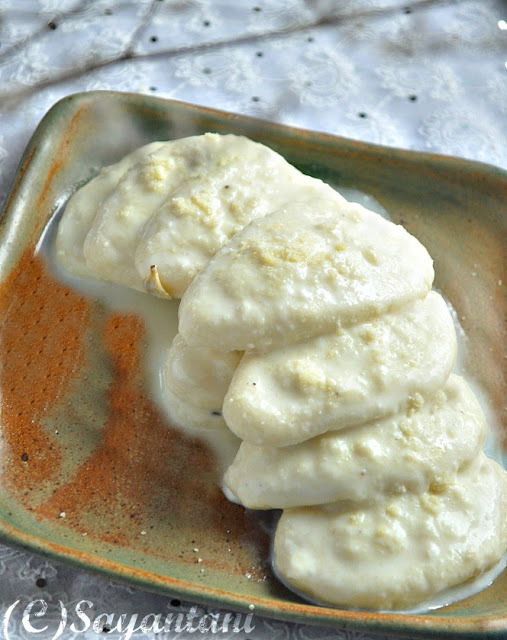 malai chomchom is the softer version of chomchom, soaked in thickened milk and served with sweetend malai or fresh milk cream (dudhe’r sor). Here I made the version that we get in Kolkata’r mishti’r dokan (sweet shops). You can try out any version of it with chopped pista or saffron starnds. I sticked to the local favourite green cardamom flavour. I used to make a lot of sweets when I was in bangalore. Made almost all kinds of Bengali mishtis like sandesh, chanar jilipi, chana pora, kamola bhog, chom chom etc. its another point that they never got their time of glory and made it to the blog. Mostly all were made for parties and the cooking always made me tired to take any picture. There is no point making mishtis at home when you stay in Kolkata. Even I dint try making them ever since I shifted base last year. but by mistake the dudhwala (milkman) delievered 4 packets of full fat milk at our door last week. I dint want to make payes so thought of making mishti. I actually need a good reason to start making some dessert, there is something about making sweets and desserts at home which certainly gives me a high. So made malai chom chom after almost 2 years. It’s a bit lengthy process but the end result is gorgeous. If you like Bengali mishti then you should give it a try or visit some Bengali sweet shop in your locality to understand what I meant by heavenly taste. Now take this and the flour in a big plate and start kneading it. Gently press and spread it on the plate with the heel of your palm. Do this for 4-5 minutes or till a smooth dough is formed. Make 12-14 balls out of it. Roll between your palm to make the outer surface smooth. Press and give it an oblong shape. Generally the two ends are little pointy. You can even make rounds and press them. Boil the water and the sugar in a wide pressure cooker. Once they come to a rolling boil place the chomchoms very carefully. Attach the lid and cook on medium till two wshistles. Let the steam dissipate naturally. Open and carefully take them out one by one. OR to cook the chomchom in a big pan bring the sugar syrup to a rolling boil. carefully put the chomchoms in. let it simmer on medium heat till they are cooked. once the chomchom are done they will float on the surface of the syrup; approx. 12-15 minutes depending on the size. While the chomchom are cooking start heating the remaining 2 cups milk. While the milk is boiling a skin will start forming on the top. With a fork carefully take this out and place in a small bowl. Do this 8-10 times. It sounds like a lot of work but its not. Keep the heat on medium and Just don’t stir the milk too much, the skin will form automatically. Once the malai cools down beta it with a fork and half of the grated khoya. Keep aside. Once you have collected enough malai add the milkmaid to it. And thicken it till its half of its original quantity. Mix in the powdered green cardamom. Now heat 2 tbsp of the milk with the malai mixture. Cook for a couple of minutes till its spreadable. Keep aside. Place the chomchom (still warm) on a wide and shallow bowl. Pour the thickened milk. Make sure every piece is coated with the milk. Let it cool down. Spread each piece with the malai mixture and sprinkle little grated khoya on top. Serve cold. This is a very delicate sweet. Do not try to store it for more than 2-3 days. 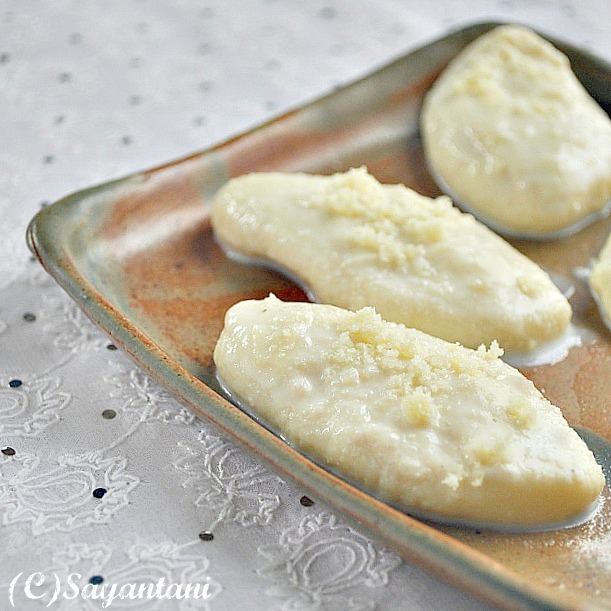 If making malai seems tedious just make a thick paste of powdered milk or khoya with milkmaid and apply. You can also decorate it with chopped nuts, clotted cream and even pipe designs on top with thick mousse like almond and cream puree. Some shops do this here. Am yet to figure out the mousse recipe though. Vallis Kid's delight, this month hosted at Cooks joy with the theme evening snacks. Beautiful pictures. Loved your platter too. This is a favorite mithai, I remember a sandwich chamcham too. Home made is always so much better than the mithai shops. Thanks Sangeeta. saw the sandwiched version on Tarla dala's page. we generally dont get to see it locally here. Hey! i just loved your blog, lovely picture, amazing recipes, such a thoroughly professional job. i am so completely impressed! Is there any way I can skip that pressure cooker step and do it in a tumbler or saucepan? Looks so tempting! Got to try. 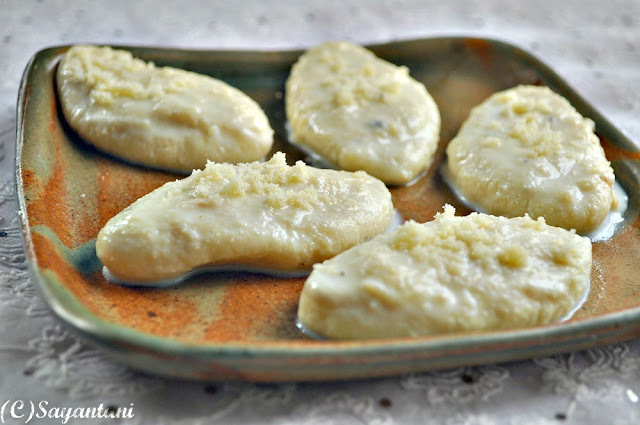 Malai chomchoms look super yummy..would love to try it some time..Love the clicks..
@Sudeshna, Have updated the post on how to cook the chomchom without the cooker. just rasogollar moto baro kono vessel e cook kore nio. New dish and looks inviting. That sweet looks incredible...looks very very delicious and neatly described procedure..
wow! gorgeous very tempting to have now.. nice picture presentation..
Am an ardent fan of bengali sweets, wish to have some chomchom anytime. darun hoyeche malai chomchom; bookmarked and will try it, however the malai segregation part is bit tedious, but will follow ur recipe to T, now looking forward to komala bhog ! cham cham is always my favorite. Your picture makes me crave. Looks so spongy and delicious. i'd love to try these. thanks for sharing! Inviting dish, looks so yummy. I have eaten loads of it back home, yours looks so good. tempts me to try it! Oh..yummity-yum! Long time I made Cham-cham..
Chanced upon your site - definitely going to subscribe on facebook. Quick question - is Milkmaid used in this recipe condensed milk? Thanks and keep up this great work! Reminds me of thetime when as kids we used to visit the only bengali sweets shop and stuff ourselves with all these beautiful sweets and cham cham was my favourite. Drooling over your pics. @Jayati, yes its Milkmaid. have updated the post too. wow this looks si yummy, reminds me of rasmalai..
Omg, this is so impressive! Love this dessert and I love the way you have shown it. I have made rasgullas before but never tried making chamcham. Will try it out as time permits. Thanks for sharing this chamcham recipe.